The brand that's synonymous with action cameras have once again changed the game - introducing the GoPro Hero6 Black! 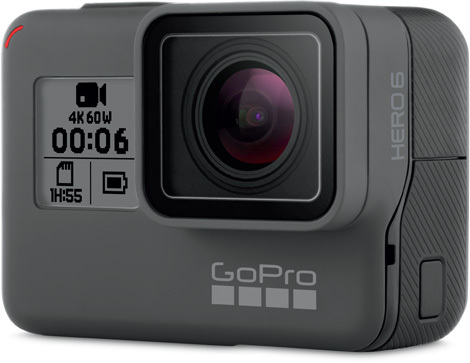 Any new camera from GoPro is bound to be welcomed with open arms by everyone from daily commuting bikers & cyclists, to extreme snowboarders, surfers & skydivers; the GoPro Hero6 Black is no exception. When any new camera is launched, it will inevitably be compared to its predecessor and the many questions that entails - What's new? What's changed? What's stayed the same? With that in mind, this article is comparing GoPro's latest Hero6 Black with the one that came before it, the GoPro Hero5 Black. At first glance, you could be forgiven for wondering what's actually changed from the Hero5 Black to the Hero6 Black, given that physically they're exactly the same. With the GoPro Hero6 Black, you've got the same, rugged, waterproof to 10m, tiny case that we found with the Hero5 Black. This is no bad thing - the Hero6 Black is an update, rather than an entirely new product line, so it's good that it's the same physical size as it means we can still use all our old mounts & cases that were bought for the Hero5 Black. Inside the Hero6 Black is the same sensor that you'll find in the Hero5 Black, which means you're able to capture 12 megapixel still images, a burst of 12 megapixel stills at up to 30 frames per second, and timelapse photo intervals. What's changed between the Hero5 Black and the Hero6 Black, however, is that the Hero6 Black brings a brand new GP1 chip into the game. This lies at the heart of the GoPro and has been optimised for GoPro capture. It offers vastly improved image quality over the Hero5 Black, as well as smooth, stabilised footage. This new processing chip also offers improvements in low light conditions, giving crisp and clear images and video. GoPro describe the Hero6 Black as having their 'Best-Ever Image Quality'. The difference in video quality between the GoPro Hero5 Black and the latest Hero6 Black is where the big changes have been made. The Hero5 Black was no slouch, it's capable of shooting Ultra-High Definition 4K video at up to 30p, and Full 1080p HD video at 120 frames per second for slow motion footage. Now, however, the Hero6 Black offers 2x the performance of the Hero5 Black with ultra-high definition 4K video recording at up to 60p, and Full 1080p HD video recording at up to 240fps for some super slow motion action shots. The difference between 30p in the Hero5 Black and 60p in the Hero6 Black will be a game changer for a lot of filmmakers, videographers, content creators, and anyone who wants to be able to slow their 4K footage down without compromising the quality. With the faster GP1 processing chip in the GoPro Hero6 Black also comes improved wireless Wi-Fi performance. Compared to the Hero5 Black, the Hero6 Black offers 3x faster offload speeds, featuring 5GHz Wi-Fi, which means you can quickly and easily transfer photos and videos to your phone. GoPro also say that the Hero6 Black captures incredibly smooth footage, whether handheld or mounted on your gear, thanks to their most advanced, next-level, video stabilisation yet. A little while ago, GoPro announced their latest innovation - Quik Stories. This is available as an upgrade to the Hero5 Black, but comes built-in as standard on the Hero6 Black. QuikStories is part of the GoPro app and takes all your videos effortlessly from your GoPro Hero6 and combines them beautifully into a fully edited, automatic video that you can then share and upload to social media without the hassle of editing the video yourself. Physically, nothing has changed between the Hero5 Black and the Hero6 Black, which is good news for anyone who's previously bought a case for their Hero5 Black and are looking to upgrade. However, internally there have been big changes. The new GP1 chip offers better image quality and improved low-light performance compared to the Hero5 Black, while video quality has been massively improved in the Hero6 Black, with UHD 4K at 60p now available alongside Full 1080p HD at 240fps. QuikStories also promises to make our lives easier, creating beautiful movies from our footage with minimal effort. 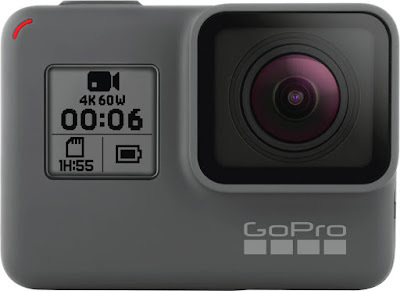 All of this combined makes the GoPro Hero6 a very welcome update from the Hero5 Black and there are sure to be plenty of people who will value the upgrades that come with the newest model. We've been lucky enough to get hands-on with the GoPro Hero6 Black before the launch - check out some of the footage below and see why we're excited about this new action camera. The GoPro Hero6 Black is available and in-stock now at Park Cameras - shop online or in one of our two stores in Burgess Hill or Central London.